Limited internet access! See you all in a week or so! Last edited by CaptainScott on Wed Apr 24, 2013 7:27 am, edited 1 time in total. Seattle an area wx yesterday had hail n snow n rain n wind n lightining n sun! Safe travels! Looking forward to reading all about it and the picts too! Lived in Seattle most of my life. We like to call it "Maybarry with Sky Scrappers" We also say "If you don't like the weather, just wait 5 minutes you will get what you like shortly." Yes indeed I too have sailed in the wind, hail, snow, rain, sprinkles, dead calm, drizzle, mist and sun again, all in the same 4 hours. I have not sailed in the thunder and lightening yet. A guy has to draw the line somewhere. We had a very nice but relatively uneventful trip to the San Juan Islands! My daughter had a friend come visit from Ohio whom really wanted to spend the night on a boat. We Left Everett Friday evening on a cold raining afternoon. Our sail has not come in yet so we motored the entire trip. We went to Langly where we spent the night. Our favorite pizza place was closed for remodel so we found a nice English pub where I had Bangers and Mash! Mmmmmm! Since we were at the dock, we had plenty of AC for heat, popcorn and movies! Saturday We woke to more cold and rain. Yuk. We headed back to Everett so we could drop the girls off. They were headed to Spokane to visit a friend and be there for the friends wedding. Half way back we spied the Victoria Clipper sitting dead in the water. We usually see it doing 20 kts or better. Hmm, must be . . . . . . WHALES! Yup! So we whale watched for about an hour then resumed our trek back to Everett. We dropped the girls off at home and headed back to Destiny where Diane and I spent the night! Sunday was to be a long day. Everett to Jones Island! we left the dock at 6:30 AM so we could catch Deception Pass on an EBB tide just before slack. Still rain and cold. After slipping through Deception Pass an hour early we were spit out into the Straights of Juan de Fuca. After passing Smith Island the clouds parted and we were in very warm sunshine! YEAH! We motored ahead through Center Channel between San Juan Island and Lopez Island. Evening found us entering the anchorage on the North side of Jones Island only to find two sailboats anchored right in the center of the small bay. We ghosted around them to take the furthest bouy from them allowing for maximum privacy. As soon as we shut Destiny motor down, the two sailboats pulled anchor and left us alone in the bay! Later in the evening we were joined by a San Juan 24 sailboat who took the furthest bouy from us! NICE! Monday we awoke to a beautiful day! 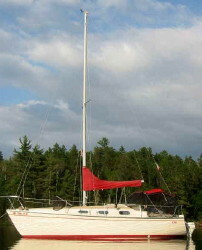 The 24' sloop left before we woke up leaving us alone until some fishing boats dropped in. About 10:00 the Parks Ranger arrived and scurried the fishermen off, Guess comercial vessals are not allowed on the bouys! NExt came a very large boat bring the start park dock with it! YES! They installed the dock while I sailed the harbor in my little Walker Bay. After the dock was installed Diane and I moved Destiny to the dock. The ranger chatted for half an hour or so and then left the isand! OMG! In the summer you are lucky to get anchorage here let alone, a bouy or god forbid a spot on the dock! Here Diane and I are left literally alone on this entire island with no campers, rangers, or other boaters! WOW! We took full advantage of the privacy, and had a most wonderful and unforgetable afternoon in the sunshine! Later that evening a 30 Catalina arrived and spent the night at the dock across from us. Tuesday was yet again a wonderfull sunshiney day and OMG! The Catalina left very early as they were gone when we woke up! More privacy and alone time! We were again left all alone on the island! NICE! That afternoon found us motoring toward Friday Harbor. The busiest harbor in the San Juan Islands. We hailed the Port asking for a slip. The gal sounded almost comical as she said take whatever we want! We motored into the marina, came around to the guest dock "G-dock" and it was empty except for one other sailboat! We grabbed a slip and settled in for the day. The other sailboat it turns out to be owed by some good friends of ours however they never turned up so Diane and I walked around town, had great meals, and settled back into Destiny for the night. Wednesday! Another beautiful day! Our plan was to spend the night in Mackaye harbor on the extreme South end of San Juan Island however NOAA had better plans for us. The hop from the harbor to Deception pass going home is an easy one. However slack tide in Deception is at 7:00 am and at 4:00 PM. Since we do not want to get up early on vacation, 4:00PM is the time. A quick check on the weather and our plans changed. A blow is coming in after lunch tomorrow. Without a full compliment of sails I prefer to avoid the weather. So we crossed Rosario Straight into Guemes channel, past Anacortes and into Swinomish sleugh where we spent the night at LacConner. We found a fantastic pub that serves prime rib where I had my fill of one of my favorite cuts of meat! Thursday we woke with intent to go to Oak Harbor for our last night out. Again, NOAA changed our plans. A healthy southern blow is coming. While Oak harbor is protected from wave action, the Southern winds blast right through it so we opted for the long haul to our home port. Instead of leaving Destiny that night we got in the truck, went out to dinner, and went back to Destiny for the night. Friday morning we gathered our stuff and headed home! 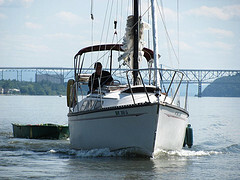 All in all a wonderfull time motoring our sailboat form port to port! I forgot my camera on this trip so these were taken with my iPad. Walking path. Entire island is a state park. Takes 5-10 minutes to cross the island at its narrowest point. We were alone on the island! Destiny all alone at the dock! My favorite picture from the trip. It is difficult to get anchorage here in summer due to crowds! Being on the dock alone was fabulous! Me sailing my new Walker Bay dinghy! 8' long and 75lbs! Nice shot of perminant moorage at Friday Harbor from our cockpit. Washington State Ferry coming in with Mt Baker in the back ground! Last edited by CaptainScott on Wed Apr 24, 2013 7:26 am, edited 1 time in total. Wow what a great story! Sounds like an excellent vacation. Nice tender you have there... does it have a drop down centerboard? Yes, it is a full blown little sailboat right down to a mini boom vang! LOL! It also has a plug for the centerboard hole so when we tow it it does not sink itself. The rudder also folds up similar to the Chryslers. It is a Walker Bay 8'. Works great for one as is but you'd need the inflateable kit for two adults! No freeboard left with to aboard! The past Sunday I winterized the snowblower and stuffed in the corner of the garage in 70 deg weather. Woke to snow falling again this morning. Nothing stuck, it's just the idea of the thing....grrrrr. (It's Michigan, we don't put the snow shovels in the attic until June 1 !!) Thanks for the log and beautiful pics. I really needed that. Wonderful narration and lovely pictures...uncovered my boat today...rain with possible snow mix predicted for this evening...but then warmer temps for the rest of the week. Thank you for posting, hope your new sail comes in soon, and hope it doesn't break the bank to get it. I have the Walker Bay 8 footer, but I did not get to sail kit. Chrysler20%26 wrote: Thank you for posting, hope your new sail comes in soon, and hope it doesn't break the bank to get it. I have the Walker Bay 8 footer, but I did not get to sail kit. Our new Genny is to be installed today and tested for fit! I'm meeting the sail maker after work on Destiny. Unfortuantely, yes, this sail broke our bank. We had some funds saved up for work around our house and I was saving for a new PU. Had enough cash to put up a fence and buy a nice but used late model truck. Figured I'd sell my current truck to Alan. If he wanted it. 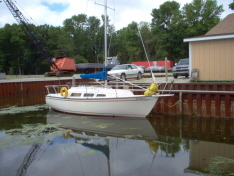 Sadly we lost our septic system, had a leaky roof at home, and blew our jib on Destiny. All unexpected. Adios denero! To boot, we'd saved up for a new fence. Since my truck funds covered the rest, we went ahead and did the fence too. I hate using any more credit than I have to so it will be another couple of years of saving before a new truck is in the picture. 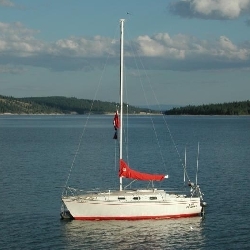 As far as the walker bay, we found ours on Craigs List and it included a brand new sail kit never installed! All for cheaper than just the boat! I was a bit leary of the Walker bay as far as a cheap plastic boat but I have to say I was very plesantly surprised at how well it works. 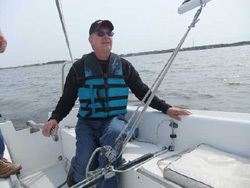 Rows very easy, sails as well as one would expect for an 8' cat rig boat, and is extremely light weight so we can indeed lift it aboard without help from block and tackle or such. The only drawback is the boat is really for one adult. Two can be in it but there is very little freeboard left unless you get the float kit. Since it is not our primary dinghy it is perfect! Bad things do happen, Michigan got 9 inches of rain in April. My basement got water in it 3 times in a week. Good news for the Great Lakes should add 3 to 5 inches to lakes. My marina is dredging my cost is $ 300.00 an my association fee $ 250.00 total $550.00. Better than renting another slip. My walker bay, I got new at a discount store here in town. I try to buy things made in USA, the box said, Walker Bay assembled in the USA an the cost of the boat was $350 for the 8 footer. So I buy the boat and bring it home. I open the boxes and start putting in the seats and other parts, then it comes to me assembled in the United States "ya" by me. 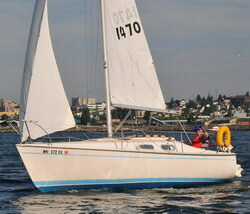 The boat sales for $ 850 sail kit $ 850 an tub kit $600, Total $2300, kind of pricey. I paid that for my C-26. Destiny is a vary nice boat, not mete to be a bower a power boat. 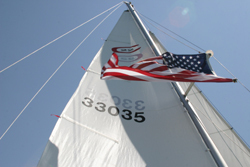 With your new sail Destiny is a sail boat, hope for years of enjoyment. Hope new sails are a good fit. Looking forward to reading of your adventures an Photos. Sounds like you both had a great time glad to read and as usual great pics.